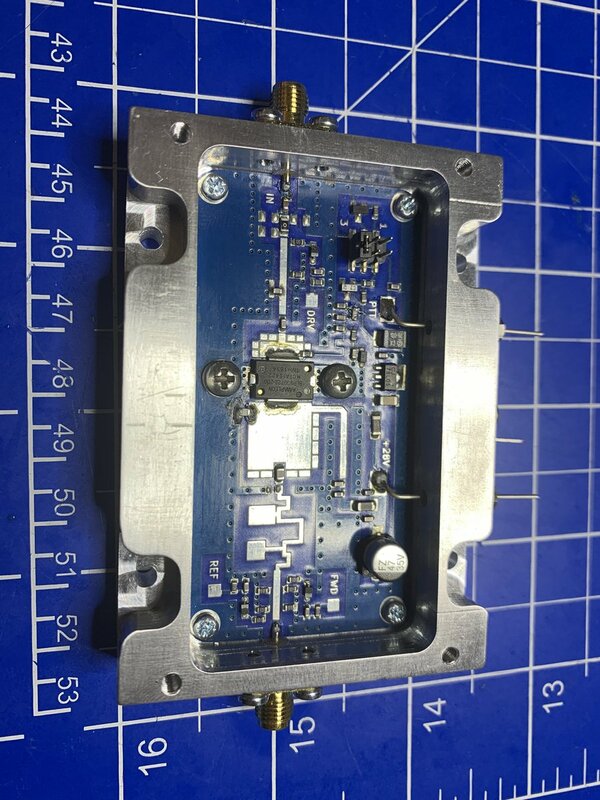 Changed the title of the thread from “SG LaboratoryLtd: Power amplifier for 2.4GHz up link” to “SG Laboratory Ltd: Power amplifier for 2.4GHz up link”. SG Lab has started the production of AMP2400. Also the delivery has started. Today (at least) one HAM received it via post. Hristiyan LZ5HP, 126 Euro plus shipment 8 Euro, delivery time about 2 weeks plus shipment. I have had the PA for 14 days now. First test are positive. At the moment I'm still preparing a heat sink for it. The PA also works with 12V and then has about 4W output power. DD1WKS what is the heatsink requirements? Is the surface machined flat with some threads so you can attach some thin layer of cooling paste and bolt down a heatsink or do you have to machine / thread etc? The size of heatsink depends on how intensively PA is used. You can check first, temperature up to 70deg C is not a problem. There is no RF VOX in PA. You need to connect power supply 28V permanently . Only 1 additonal connection is needed - between sequencer output of TRV (second ring of 3.5mm jack) and PTT pin of PA. The jumper in PA must be set to position 1. Depending of connecting cable loss , you need to reduce transverter power by TX trimmer. PA input drive can be monitored at "DRV" pin, voltage must be about 0.2V . PA output power can be monitored at "FWD" pad , voltage must be about 3.5V for full power. Last tests shows, that 20W is too high power, if you use 70cm dish or larger. You can reduce PA power by reducing drive or by reducing power supply voltage down to 12V, @12V output power is ~4W. I got a shipment notice yesterday for my PA I ordered. Thanks for the info Heiner. Me too and it took 3 emails. So he is about. has anyone already received the Version V1.5 of the TR2300? With SG-LAB you can feel comfortable. Requests are obviously many and waiting times are getting longer. But everything ends in the best way. here some additional information regarding the 2.4 GHz 20W Power Amplifier V2. Attached you find the actual specification. Further I got some hints by Hristiyan, LZ5HP, today. Yes, you must connect sequencer output to PTT pin of PA and set the jumper in PA to pos. 1 . If the connecting cable between transverter and PA has low losses, you can reduce transverter output power by TX trimmer or by reduction of power supply voltage. Another possibility is to solder 3-4dB PI-type attenuator on PA board - there is a free place for this, now the attenuator is skipped by 0-ohm resistor. You can monitor input drive, output and reflected power on marked pins by a Voltmeter. Of course, no problem to share or upload the datasheet. My SG 13cm PA just arrived. my as well..just in the moment.. When did you order the PA? ... I have already emailed SG-LAB several times but I don't get an answer ... And the website still says "coming soon"
PE1ANS I ordered my PA on March 7th and got it today.. easy communication...everthing fine..